2008 E90 323I advice please! / 2008 E90 323I advice please! My 2008 323I have been giving me hassles, Of anyone had the same issue please advise. In the mornings on commute to work the car pulls as normal (yes i know . . .For a 323 atleast) If during my commute i stop and switch the car off for 10min whilst running in a the shop for some drinks and start it up the throttle response is gone, the car is very hesitant to accelerate, and the revs takes is slow to return to idle when approaching a traffic light with the clutch in. Now, i went to 3 dealers including the only bmw dealer we have locally and every time its costing me more and more cash without the problem getting resolved. Whats been done is, Vanos solonoids have been cleaned including the filters (Twice) Oil changed 3 times. Valve/tappet cover replaced for a small fee of 7k and cleaned the MAF sensor. Car still does the same. When this happens i notice way more pops out the exhaust as if the car is running rich, When i pull over, switch the car off and start it again its fine. By now ive spend almost 12k on getting this fixed with no joy. Is this a vacuum leak? Still have dirty vanos solonoid filters? Fuel pump? Im lost and your help will be appreciated as BMW dealer wants to replace the whole head for 60 - 80K to fix the issue. RE: 2008 E90 323I advice please! As above, check codes first. The problem you are having is almost exactly what I had few years back. Hesitant revs, slow hesitant gear changes, pops at exhaust etc. The codes thrown were for Vanos bank 1 over retard. CLEANING THE SOLENOIDS DID NOT HELP! I have seen many people have the problem and cleaning them did not help. Replacing both fixed my issues. They're R1200 each from Masterparts. BMW sell them for R2600 each. (10-01-2019 07:57 AM)husaindindar Wrote: As above, check codes first. Mostly also vanos codes, cleaned them swopped around, no joy. (10-01-2019 03:18 PM)Waynethelame Wrote: Mostly also vanos codes, cleaned them swopped around, no joy. Don't waste your time cleaning and swapping. If it does work - you're just buying yourself some time. The part will fail eventually. I have gone through this on two N52's now. (10-01-2019 12:51 PM)SubLoaded Wrote: They're R1200 each from Masterparts. BMW sell them for R2600 each. What a bummer as my car has a extended warranty which ends tomorrow and al 3 Mechanics went to other faults instead of solonoids. Tanks alot for your replies! 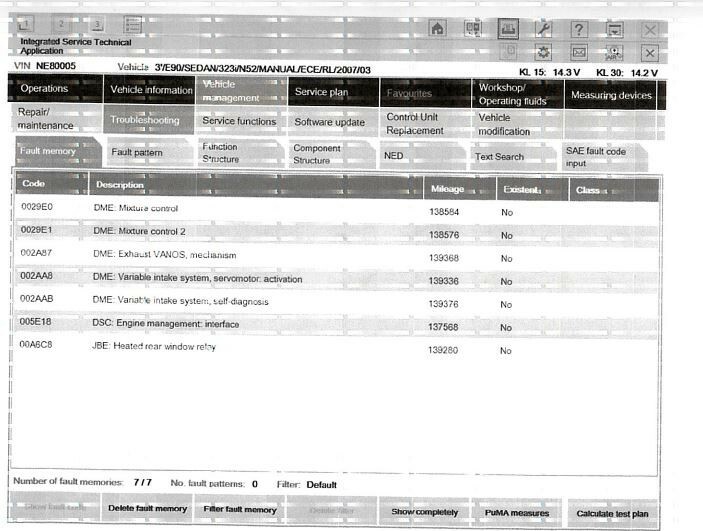 Check above diagnostics from BMW dealer. Although these came up prior to replacing the valve/tappet cover. My car went in today to replace the Vanos solonoids, warranty covers 6K on them although the mechanic quoted +-10K per vanos unit. I then asked them to replace the solonoids only as i have no idea what the whole unit entails and 10K per unit is ridiculous. Will keep the threat updated if this resolved the problem when i get my car back. IMO, I think there's 2 faults based on the diagnostics. Im very sure the vanos solenoids are cooked. Also theres a DISA thats also faulty. The vanos is whats causing the biggest problems. The disa fault will just have a code and affect performance slightly. (11-01-2019 08:02 AM)husaindindar Wrote: IMO, I think there's 2 faults based on the diagnostics. Someone rebuilding a 525I mentioned the DISA also. This sounds like a rabbit hole. I see they are not that expensive to replace but can it be cleaned? Now that you mentioned that, the though will always be there "performance is slightly affected"
It's not a rabbit hole. These are solid motors. Start with the vanos solenoids. Maybe try swapping solenoids with a friend that has a 323/25/30 (same solenoids), if the cost risk is too much to bear. DISA flaps from dealers are very expensive. Close to 6k. They cannot be cleaned. Tackle that after the Vanos. The solonoids are getting replaced today. Dont think i ever experience my car performing like it should so i wont notice if the DISA valve is giving issues, what is the error related to the DISA valve that i can look out for? Sometimes the disa flap guide wears out, so it just flaps around as you accelerate. Its audible and can be felt on acceleration. Update: Car went in on Friday, they could not replicate the problem while the car was there, This weekend the car did the same and this morning all was fine until i poped into the shops, soon as i started the car it misfired, died and after struggling to start it has a misfire. Took it back to the dealer today and hopefully this time the car gets sorted. Update: My car went in to get the Exhaust Vanos gear replaced and timing redone. 8K later and . . .
After 20 mins drive same as before and they took 3 days to replace the part. Could this still be the Vanos filters getting clogged up? As when i turn the car off and back on at a traffic light throttle response is back and the car pulls. I feel your pain especially as they are throwing parts at it.